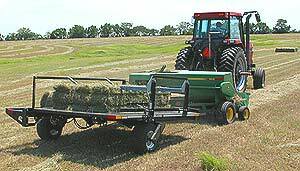 This unit attaches directly to the baler at two points; the baler's wagon hitch and a stabilizer hitch. These two hitch points keep the accumulator aligned with the bale chamber at all times. This allows the baler/accumu-lator combination to be backed up as a unit. Towed behind the baler, the accumulator is powered by the tractor's hydraulic system. As the baler pushes the bales onto the accumulator, a pivoting arm automatically lifts two bales at a time and puts them on the bed, while turning them a quarter turn. 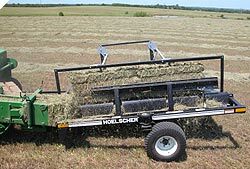 By turning the bales on edge, hay spoilage and mold is reduced, and the bales will keep their shape better. When fully loaded with ten bales the bed automatically dumps, and the bales slide off the back in a tight uniform package. There's no need to stop or slow down, the unit does it all. The high dump angle assures that all the bales will slide off evenly, regardless of travel speed. These packages of bales are now ready to be picked up with a fork.